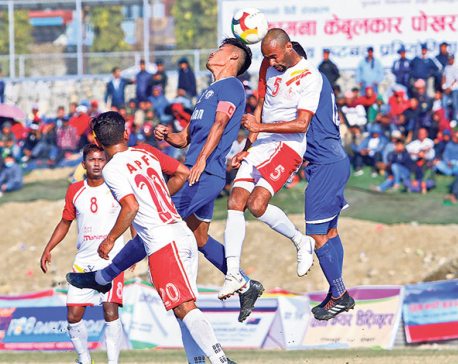 POKHARA, Feb 9: The departmental team Armed Police Force (APF) Club has advanced into the final of the ongoing sixth Manakamana Cable Car Pokhara Cup with a 4-1 penalty shootout win over Japan’s Risho University in Pokhara on Friday. The game was pushed into the tie-breaker after the teams finished goalless in the regulation and the extra time. Sudip Shikhrakar, Aashish Lama, Rajeev Lopchan and goalkeeper Raju Nagarkoti scored for the departmental team, while keeper Nagarkoti saved Tatsuki Takeda’s penalty to increase his team’s winning chance. Takudo Yosino’s shot went over the bar, while only Takuya Hitomi scored for the team. APF didn’t let Risho score a goal clearing and defending well against its chances. Risho was dominating in the game from the initial stage. Yoji Fujimori’s side volley in the 13th minute was saved by Nagarkoti, while captain Takuya Hitomi’s shot in the 54th minute was punched away by Nagarkoti. The visiting team got another chance as Hitomi’s shot was punched away by Nagarkoti in the 85th minute, and the rebound header from Yota Umihara went over the bar. Takeda hit a corner in the 87th minute, and the header from Unihara went wide again. 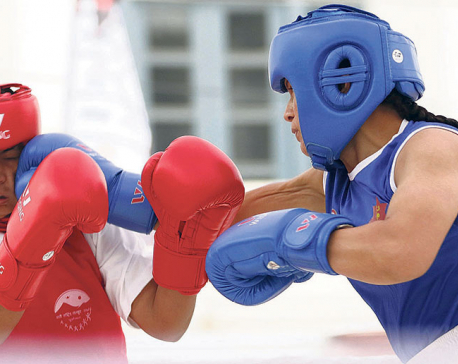 Manang Marshyangdi Club will take on Cameroon’s Dauphins Football Club in the second semifinal match on Saturday.